Vial filling for a range of complex biologics, viral vectors for use in gene therapies and small molecule drugs. Analytical & microbiological testing including raw materials, in-process controls, QC release & stability. QP release & GMP certification with QA review of every one of your batches. Full packaging support for your product including bespoke design, printing and assembly to ensure its delivered on time & to specification. A range of product development services to get products from the pre-clinical phase into clinical trials. We are a UK-based contract manufacturing organisation (CMO) that specialises in the GMP manufacture and sterile fill-finish of vials for clinical trials and low volume commercial supply. Our biologic and small molecule production capabilities support biotech and pharmaceutical companies across the world that require injectable products. Our facility was purpose-built to meet increasing market demand for small-scale, shorter sterile drug product development timelines, while consistently maintaining regulatory compliance. We reliably support our customers with the aseptic filling and lyophilisation of conventional, biologic and cytotoxic drugs into vials. Helping clients across the globe meet their project milestones, we provide rapid access to manufacturing slots and quick release of drug product to ensure tight timelines are successfully met. 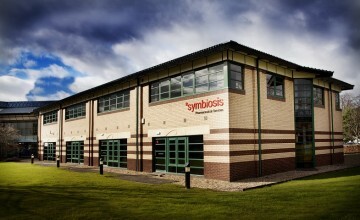 We built our facility at the Innovation Park in Stirling in 2011 with technical capability, quality assurance and operational flexibility at its core. Its design gives you quick access to production slots to progress batch release in less time, without any compromise on quality. Manufacturing takes place within a purpose-built MHRA-licensed and FDA inspected facility, enabling us to fill bulk volumes <100 litres. This includes products such as monoclonal antibodies (mAbs), proteins, peptides, Ribonucleic Acid (RNA), cytotoxic, cytostatic and high potent APIs including antibody drug conjugates (ADCs).